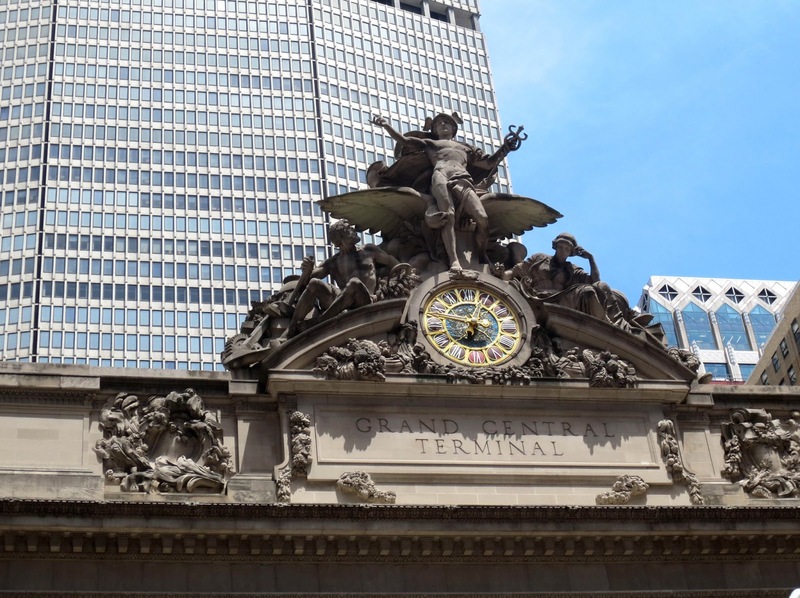 This year New York's Grand Central Terminal turned 100. The building is not the first one built on the same space. 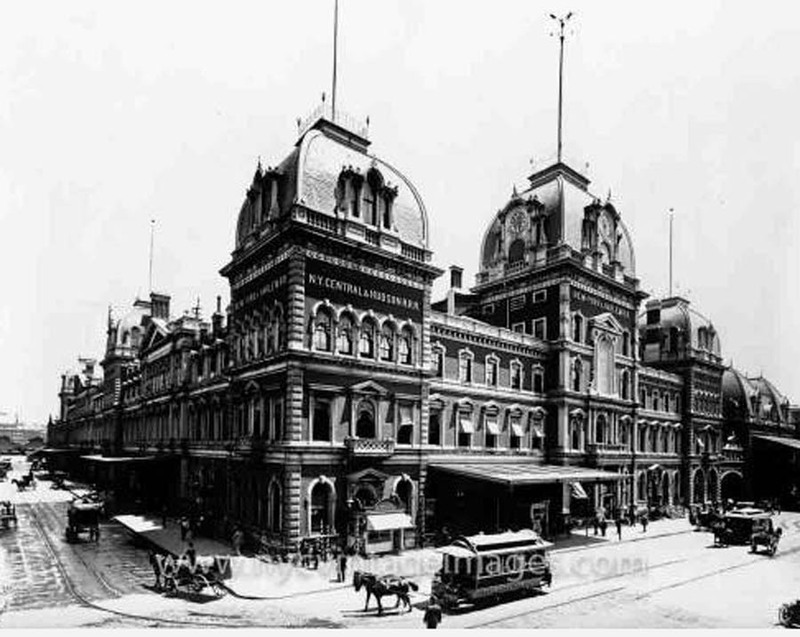 Grand Central Depot, built by Cornelius Vanderbilt, opened in 1871. Depot had an ornate Second Empire-style façade, iron and glass train shed 100 feet high and 15 tracks—one of the largest interior spaces in America at that time. There was a four-track ventilated tunnel from 56th to 96th Street and an open track bed along Park Avenue. Steam locomotives on all this tracks generated a lot of smoke and dust. The traffic was growing very quickly - there were 22 tracks in 1898. Vanderbilt family announced plans to construct a new station after the tragic accident happened in 1902: one commuter train crashed into another, killing 15. The huge dirty cloud, emanating from the station area, blinded the train’s driver. In 1903 the Central invited architects to submit designs for the new terminal. One firm suggested to build a baroque, a turreted confection with Park Avenue slicing it into two separate parts; another proposed to build 60-story skyscraper atop the terminal. Reed & Stem, a St. Paul firm, won the competition. Allen H. Stem was Wilgus’s brother-in-law. Soon after that, Warren & Wetmore (Whitney Warren was William Vanderbilt’s cousin) submitted an alternative design. In 1903, the board of directors, including Cornelius II Vanderbilt and William K. Vanderbilt, William Rockefeller and J. P. Morgan approved the plan. More than hundred houses, three churches and two hospitals have to be demolished. 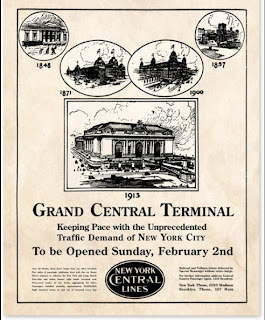 Grand Central Depot was demolished too.The construction of the new Terminal lasted for ten years (from 1903 - 1913). The terminal alone cost $43 million to build, the equivalent of about $1 billion today. The new construction was done without disrupting the daily arrivals and departures of hundreds of trains, whose numbers had been increasing each year. During the entire demolition and rebuilding, train service never stopped. The work was difficult. The quantity of rock and soil that was excavated for the two levels of tracks was stupendous—3 million cubic yards. At peak periods, 10,000 workers were assigned to the site and work progressed around the clock. William J. Wilgus took advantage of the recent electrification technology and proposed to build a bi-level station below ground. Air rights over the tracks and platforms were sold for real-estate development. 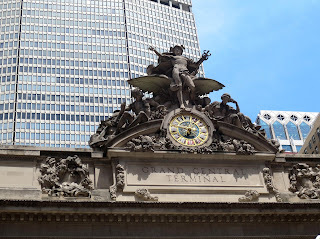 In next several years apartment and office buildings were erected around Grand Central and the area was turned the most desirable commercial office district in Manhattan – Terminal City. The leading architect of the building, Whitney Warren, wanted to bring a lot of Parisian flair to New York City with his Beaux-Arts style. Warren brought a bunch of his French friends who worked on the project with him. The building of Grand Central was the largest construction project in New York’s history up to that time and was as one of the world’s first all-electric buildings. 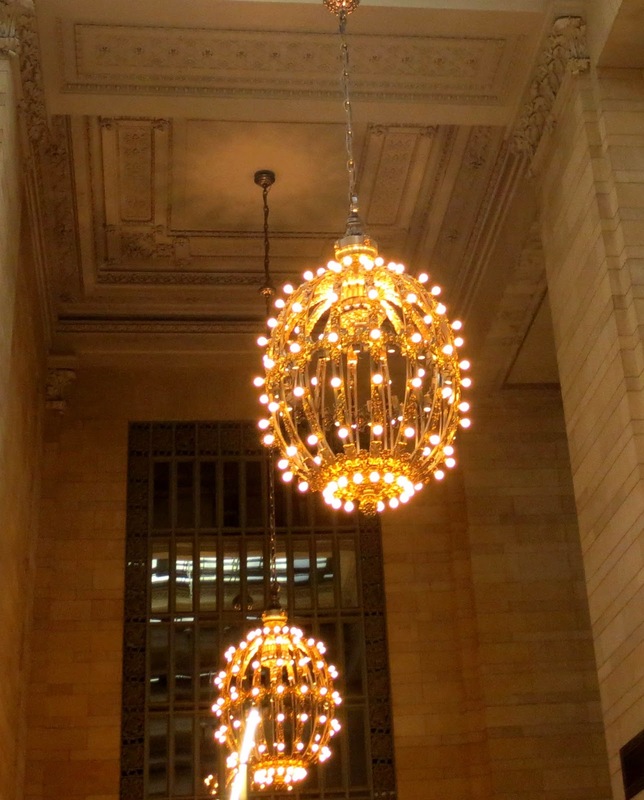 When the station was opened in 1913 , there were more than 4000 light bulbs in chandeliers and lighting fixtures, and all of them were uncovered. 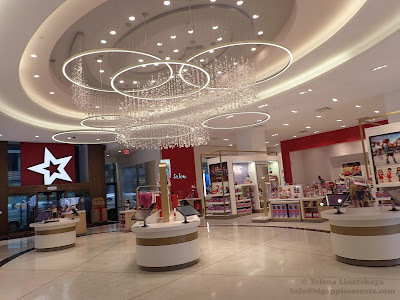 There are now over then 35000 light bulbs, but they still remain bare. Another innovation was the extensive use of ramps, rather than stairs, throughout the station. When the Terminal was opened there was a separate women’s waiting room with maids at the ready, a ladies’ shoe-polishing room and dressing room, and a private barber shop for men. Terminal had served as an important cultural hub for the city of New York. There was a movie theater, on-site museum, restaurants and even an art school, established in the 1920s by a group of painters included John Singer Sargent, which offered lessons to hundreds of students before closing in 1944.The school was on the 7-th floor of the east wing and Norman Rockwell was one of the students. 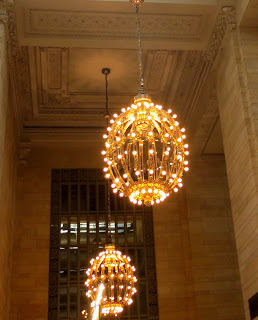 After fifty years of usage Grand Central became dirty and seedy. It was dark and dusty, windows were broken. The terminal was owned by the Penn Central Railroad. Penn was close to the bankruptcy. 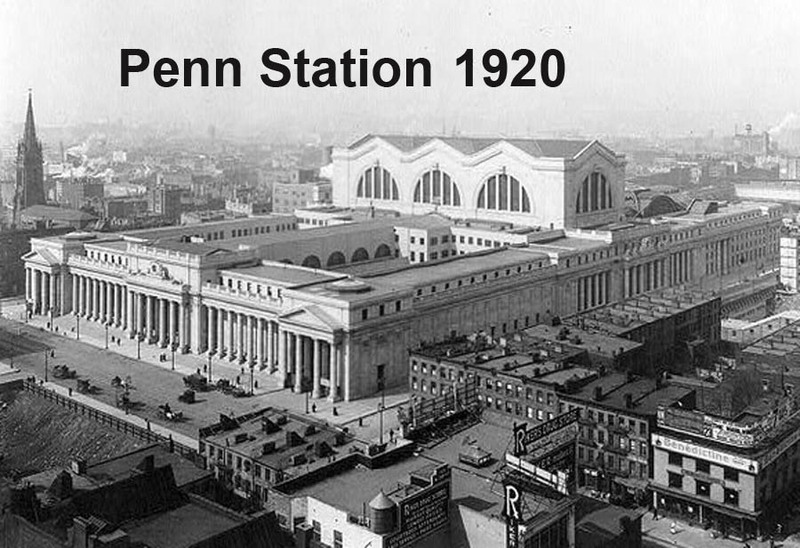 The developments rights of the Penn station were sold to the company that destroyed the station. The beautiful Penn station was made of pink granite with the Greek Doric columns and had the largest indoor space in the world. 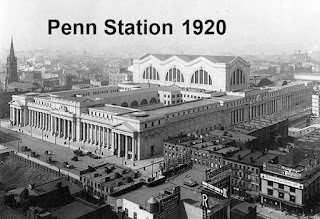 Penn Station was demolished in 1962 – there is a Madison Square garden on its place now.Penn Central Railroad proposed to do to Grand Central what it had done to Penn Station. The 1963 demolition of Pennsylvania Station served as catalyst for an architectural preservation movement within the United States. 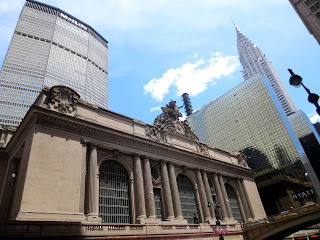 New Landmarks Preservation Commission was created and Grand Central Terminal was designated as a New York City Landmark. The owners sued in state supreme court, claiming the new landmark law was unconstitutional. The railroad won. But New York City won the appeal and the case then moved to the U.S. Supreme Court. New York won and Grand Central was saved. This was the first time when the court ruled on historic preservation. The building has a lot of hidden secrets such as secret room, secret track, a hole in the ceiling that intentionally was not repaired. I’ll tell about it in my next post.